London-based, global mobile advertising marketplace Adfonic released its Mobile AdMetrics Report last Wednesday, with data on the state of mobile advertising globally, regionally, and broken out by demographic. Adfonic enables advertisers to bid for display advertising space on mobile sites and applications to extend their reach and drive results, and publishers to maximize the earning potential of their mobile traffic. The company competes closely with AdMob,Millenial Media, and InMobi, is building out a strong global presence and expanding heavily in the U.S..
Adfonic runs an average of over 4,000 campaigns a month for clients, including: Samsung, Warner Bros., eBay, McDonalds, Groupon and Google, and reaches an estimated 200 million mobile unique users monthly. Almost 80 billion ad requests were generated through Adfonic’s marketplace during Q2 2012. Gender targeting drives improved performance. Gender-targeted campaigns are more likely to deliver above-average CTRs. For example, at the global level, there is a 164% uplift in tech and telecoms campaigns that are male targeted. Globally, Adfonic’s total ad requests increased 15% quarter on quarter, with 8,256 active campaigns in Q2. Europe experienced the strongest growth, currently standing at 23 billion ad requests, a change of 34% quarter on quarter that enabled it to surpass North America for the first time. The report noted that the Entertainment, Media and Technology audiences combined account for two-thirds of advertiser spend. The iPad captured 55% of all tablet impressions, while the Android market was still very segmented. Within Android, the Kindle Fire continue to gain share and showed above-average CTR and eCPM performance. North America: The tablet format increased its share to 11%. Android was dominant by a high margin, with 63% share compared with iOS at 30% share. The Kindle Fire was second to the iPad in volume of impressions but was far above in terms of CTR and eCPM. The iPhone lost 8% market share in Q2, but still generated 15% above-average CTR performance. Europe: The Android platform took 8% market share away from iOS, which, however, still commanded a significant eCPM premium of 53% over Android. RIM still maintained a significant share in Europe (18%), where Blackberry Messenger was popular with younger demographics. Of the top ten European devices, Apple devices achieved the highest CTR and eCPM. Among verticals, Entertainment & Media achieved an impressive conversion uplift of 707% above average, followed by Business & Finance (+117%). Asia: Nokia and Symbian held about one-fifth of the market and achieved high eCPMs, +43% higher than the Asia average. In terms of verticals, Entertainment and Media drove 50% of spend, achieving an impressive +42% conversion rate uplift. Technology & Telecoms followed with CTRs 52% above average. South America: RIM, an attractive platform for younger audiences, took about 9% market share from iOS and Android. 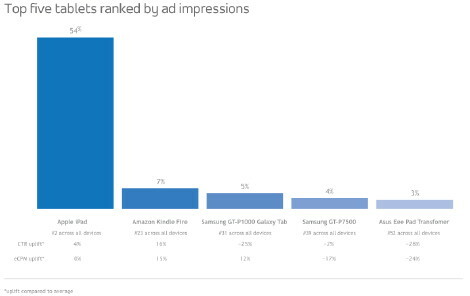 Although Apple still dominated the manufacturer league, with 34% of ad impressions, Samsung achieved the highest CTR (+44% above average) and eCPM (+41%). Samsung’s Galaxy Mini showed top CTR performance (+117%), with 15% market share. Samsung emerged as the strongest challenger to Apple’s 68% share of the tablet market. Entertainment and Media made up 50% of the advertising spend and achieved some of the highest CTRs (45% higher than the average), followed by Travel (+24%). The Social & Dating vertical commanded higher CPC prices (+33%). Africa: The Java and Symbian platforms increased their dominance, with a combined 63% of the market, against 50% in Q1. Nokia, the most recognized brand in Africa, accounted for 57% of all ad impressions in Q2. Despite Nokia’s overall market share, Apple and RIM took the top two positions in an extremely fragmented market, with RIM more than doubling the average eCPM. 69% of the advertising spend in Q2 came from the Technology and Telecoms vertical. Gender mix is male-biased except for Europe, where it is balanced. Males are more active in the morning, females in the evening. Teenagers show the highest propensity to click (29% above average) and convert (+54%). The 40-59 group clicks less often than average (22% below) and converts more post-click (+52%). Men click 3% more often than women, but women convert 31% more frequently. Travel campaigns on tablets show a 61% uplift. Tech and Telecoms, Automotive and Social and Dating also perform well on tablets. Adfonic is headquartered in London with further operations in New York, Paris, Madrid, Munich, San Francisco and Singapore. This entry was posted on Monday, July 23rd, 2012 at 10:00 @458 and is filed under DailyDOOH Update. You can follow any responses to this entry through the RSS 2.0 feed. You can leave a response, or trackback from your own site.